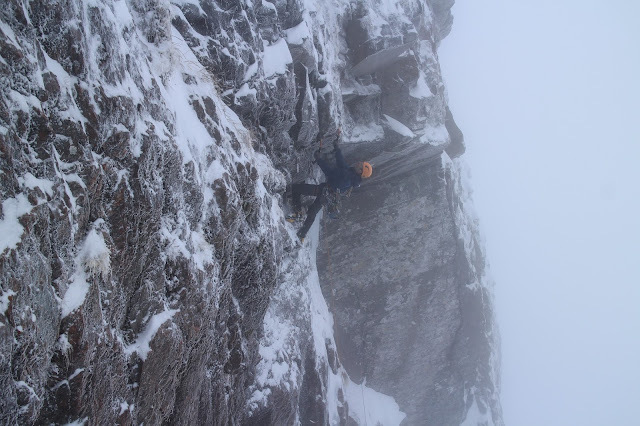 Iain Small starting out on the bold lower half of Mr Fahrenheit E7 6b on the Comb, Ben Nevis. The prow on the right is my own route Anubis (E8) from 2005. This summer is ridiculous. Anyone who reads my blog a lot will know I hate climbing in the heat, and so you wouldn’t need to be Sherlock to deduce that my recent location has been among the shady recesses above 1000m on Ben Nevis. There was a brief interlude of far cooler temps and so I was on my projects on Binnien Shuas. Unfortunately Iain’s car broke down on the way to meet me so the easier one did not get led on the cool day. Instead I shunted on the harder one and have now done the moves and some short links. Its going to be a hard one. It could be as hard as 8c, and out of range of the gear on the last couple of moves of the crux section. It will have to wait until I have more sessions on it in good conditions. Back to this heatwave. When Iain got his car fixed we walked up the Ben. At least the inside of the CIC hut was coolish. 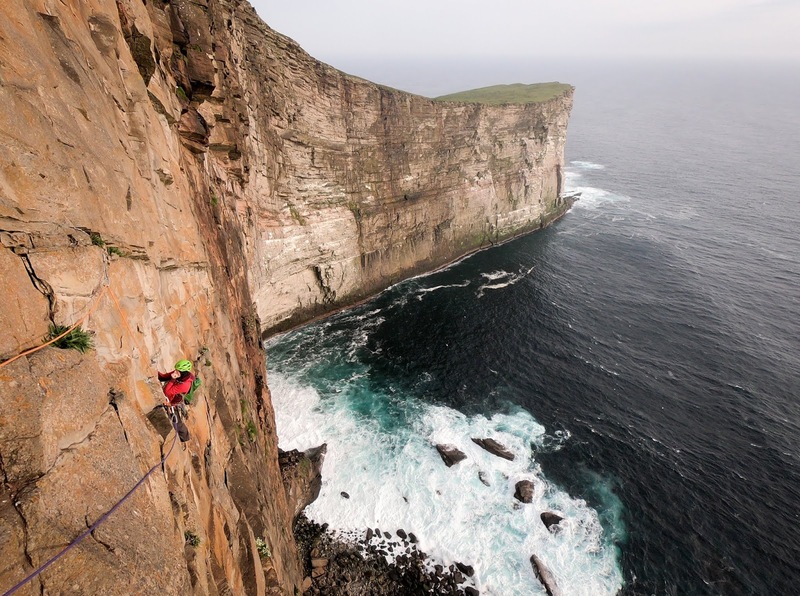 We decided on checking out a brilliant looking finger crack I’d seen on The Comb while abseiling down ‘Don’t Die of Ignorance’ years ago to retrieve some gear after my FFA in winter (a long story). 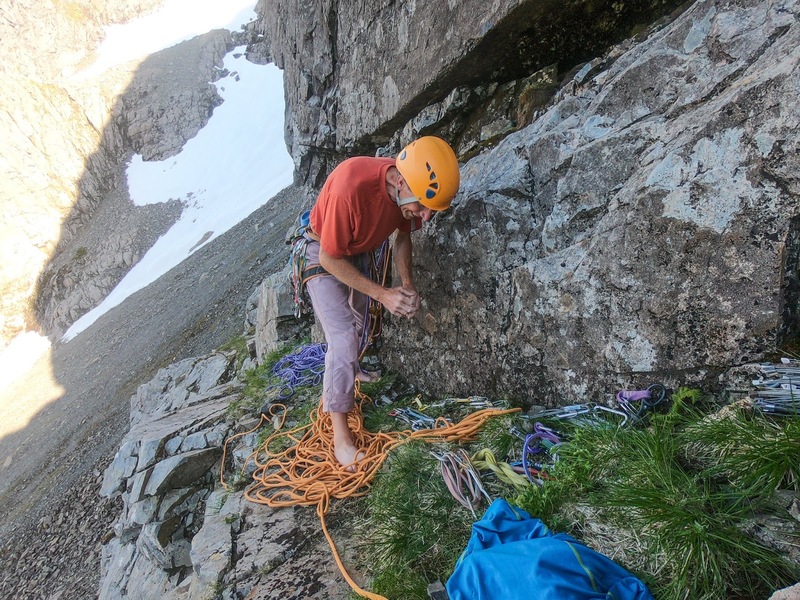 To access the pitch to clean it, we reclimbed the crux pitch of Don’t Die which was weird to see it in summer conditions. 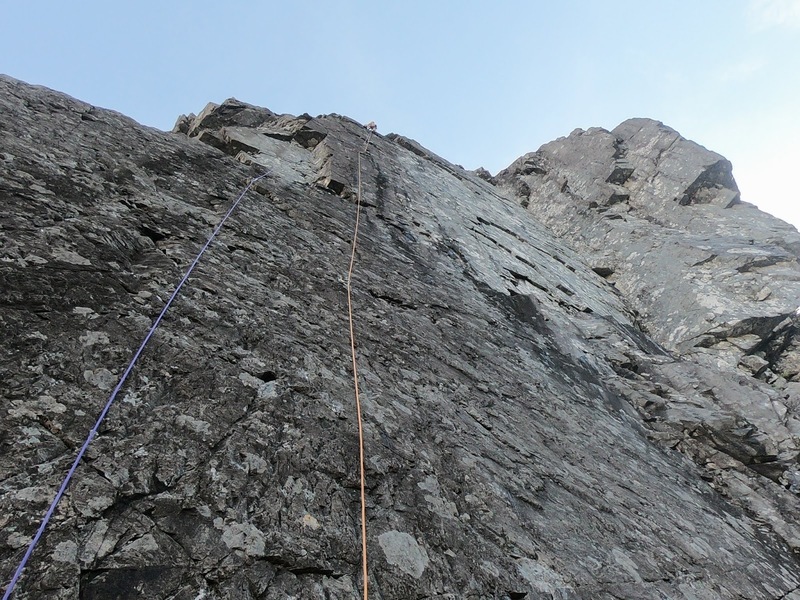 Particularly odd to go back to the belay with no t-shirt on, where I’d previously spent 4 hours in a hypothermic state getting frost-nip in my fingers. I spent the rest of the afternoon/evening cleaning the 55m pitch on the wall below. It looked absolutely amazing on immaculate rock. 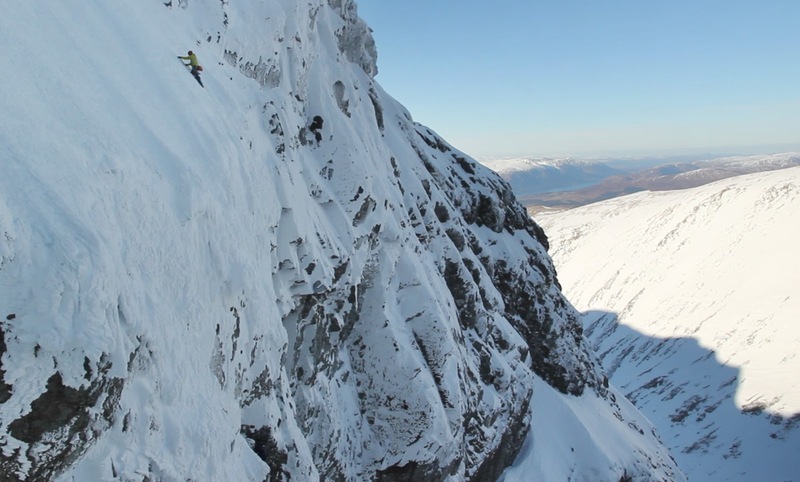 Ben Nevis at its best. It was however a pitch of contrast, the lower slab was something straight out of Cloggy, albeit on better rock. 6a climbing on edges but with one real runner in 20m. The upper half was well protected but sustained and physical. We stayed in the hut and I got sunburned just drinking a cup of tea outside in the morning. 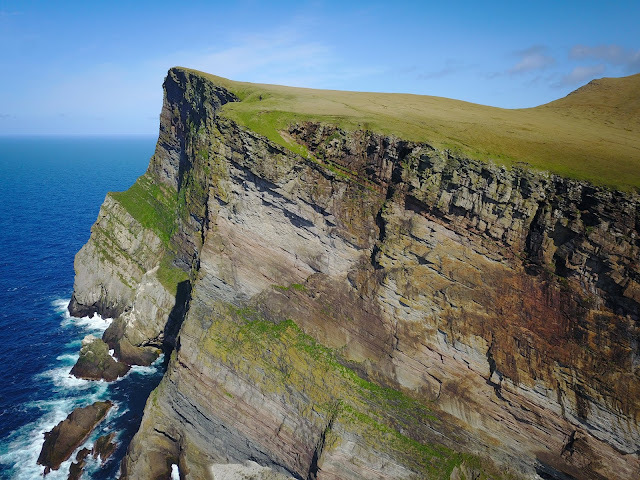 Time to get into the shade of the cliffs. After spending some time with my feet in the snow (lovely!) I tied in and climbed the slab quickly to get it out of the way. My feet were hot and sore already and I couldn’t get settled for the hard half of the pitch above. So I just had to carry on, unsettled. Nevertheless, I enjoyed the scrap with the wall cracks since the climbing was just so good and abseiled off to give Iain his turn. Ian told me he had listened to my comment about sweat running out of my helmet at the top and so paced himself a bit on the rests. Whether that made a difference or not I don’t know, but he looked like he enjoyed the pitch as well. Iain getting racked up for the lead. Iain at the top of the slab section, where you reach some welcome runners. We called the climb Mr Fahrenheit. 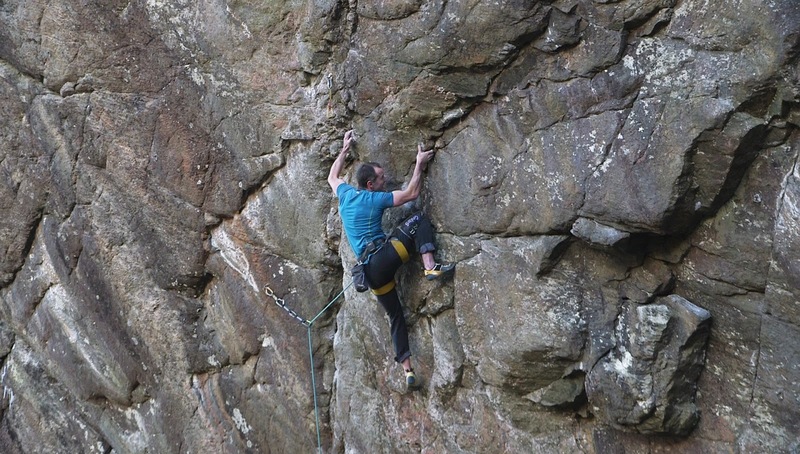 The first route on the buttress, Don’t Die of Ignorance, was first aid climbed by Andy Cave and Simon Yates in 1987 (and freed in winter by myself in 2008). That name was the slogan for the widely seen scary public health ads for the feared AIDS crisis in the late eighties. I remember clearly seeing those ads as an 8-year old even though I had no idea what they were on about. Anyway it made me think of Freddy Mercury and so we thought of something from Queen’s songs that related to the unprecedented heat right now. 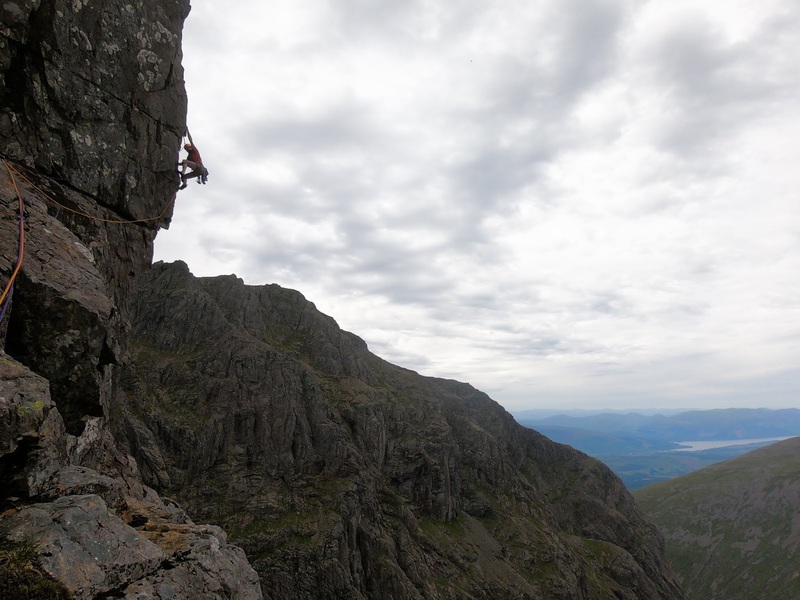 Every time I climb on Ben Nevis in summer, I think ‘I should do this more, the rock is so good’. And of course, you’ll be hard pressed to find anywhere cooler in the UK. 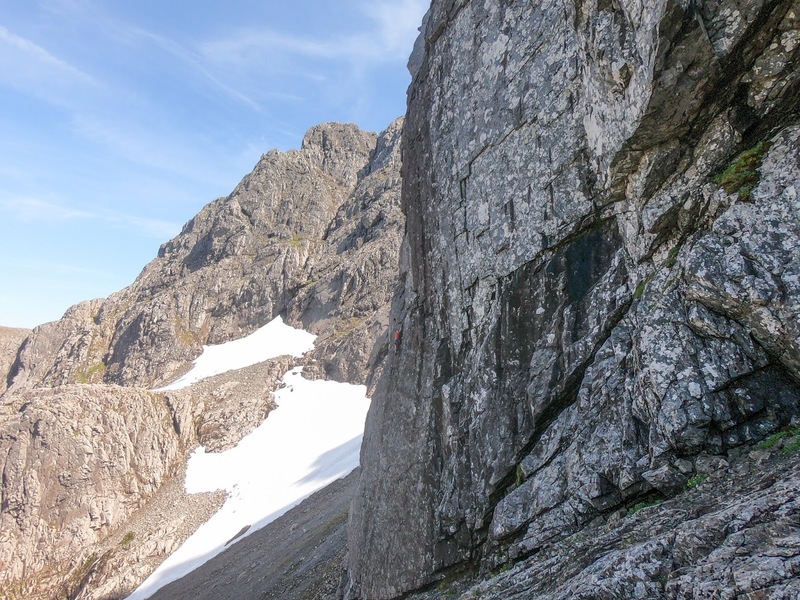 As we trotted about the Coire en route to this line, we eyed up the endless potential for other new routes that still exists on Ben Nevis. Reaching the end of the wall cracks section. 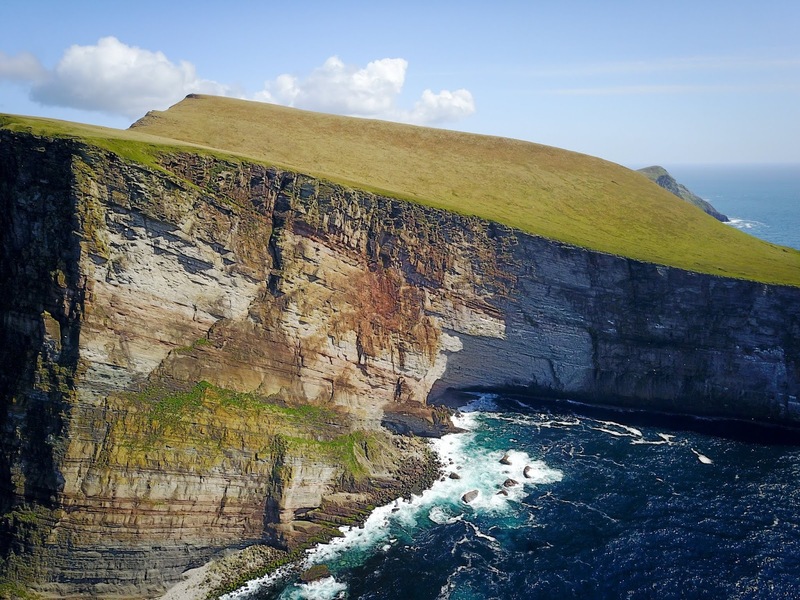 Aerial shot of the Comb. Mr Fahrenheit takes the obvious brown streak. Aside from various gloves, goggles and very new and very old Nevis bits of gear lying about the screes, we found lots of other odd things folks carry up the Ben. Back in March I had a great day out climbing a link-up I’d thought about for many years: Font 8A boulder, E8 trad, 8a sport, VIII,8 winter route and 8 Munros in 24 hours. I blogged about it at the time here, but now the film is ready. Enjoy. 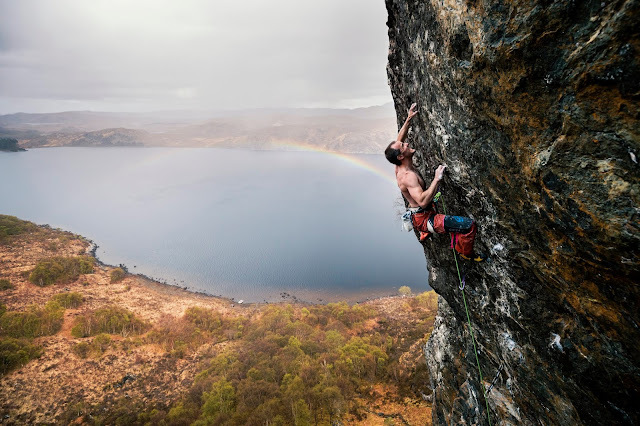 I think its a nice reminder of why people make such a big deal about Scottish climbing. Thanks to Kevin Woods for making the film and Mountain Equipment for supporting it. 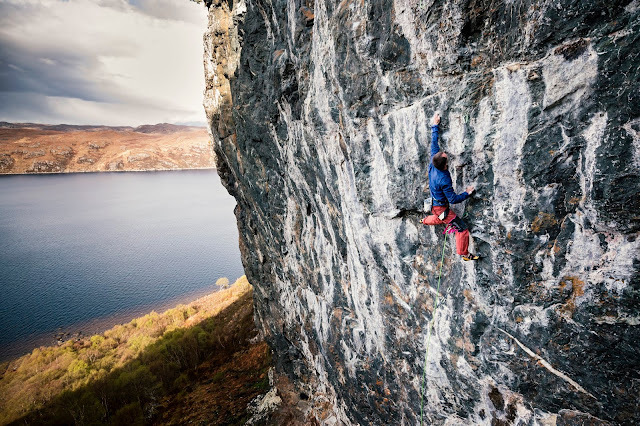 I moved to Lochaber ten years ago and one thing you cannot escape as a local is that in spring, conditions are amazing for every type of climbing. If you are an all-round climber in the area, spring equates to doing very little work, having no rest days at all, being exhausted for three months straight but having a huge number of fantastic memorable days out climbing. You find yourself trying to recover from winter climbing fast enough to take advantage of great conditions for your rock projects, almost wishing for a rainy day to make an excuse to rest. 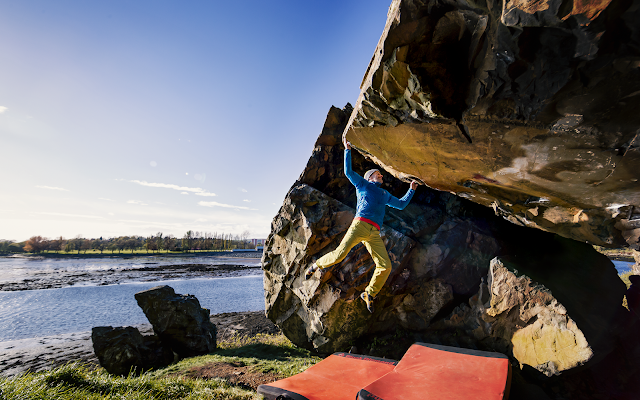 This is why it is the best all-rounder climbing area I know of, anywhere. 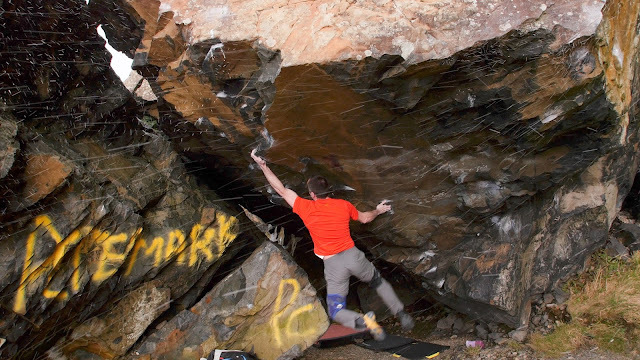 Soon after I moved up, I had the spark of an idea to link up routes of all the climbing disciplines in one day. There are so many different types of climbing crammed into the Nevis area. I wondered if it would be possible and if so, at what level of difficulty? I don’t normally do link-ups or that sort of thing (not because I don’t like them, I just tend to focus on my climbing projects), so if I was going to do one, it would need to be a special one, that would be hard to complete and require a high general standard of climbing ability. I started calling it ‘the twenty four eight’ in my head and mentioned it to various people. I put a recce day or two into preparing for it in various winters over the past 8 years or so. I even lined up to have a proper go at it once, about 4 or 5 years ago. It was the usual problem. 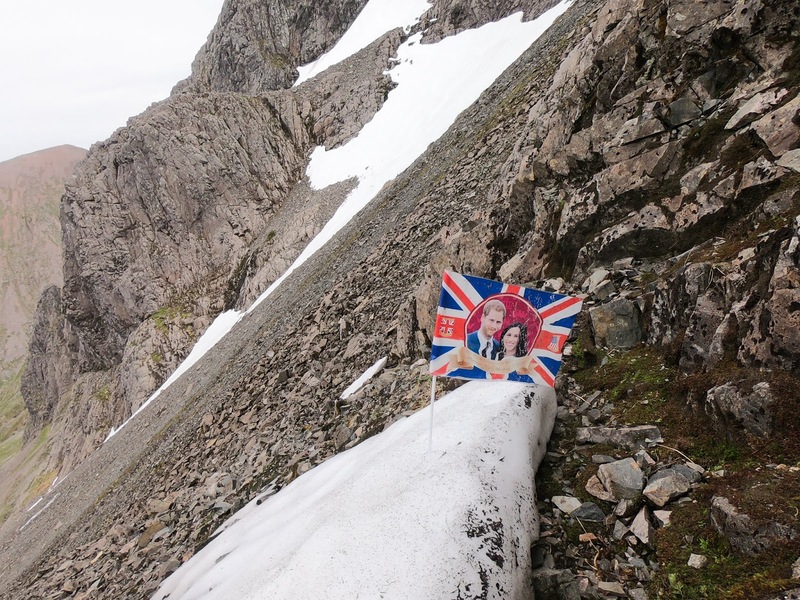 If the mixed routes on the Ben were white, the rock routes in the glen were either also snowed up, or soaking wet. Or if the rock routes were dry then so was the mixed on the Ben. 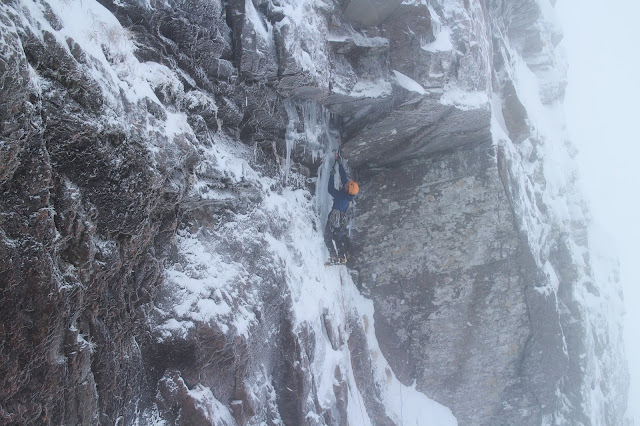 So although I said above that spring in Lochaber allows you to do everything, thats rarely true on the same day, at least if you are talking about EVERY discipline, and going for hard routes. If it was grade Vs it would be no bother. 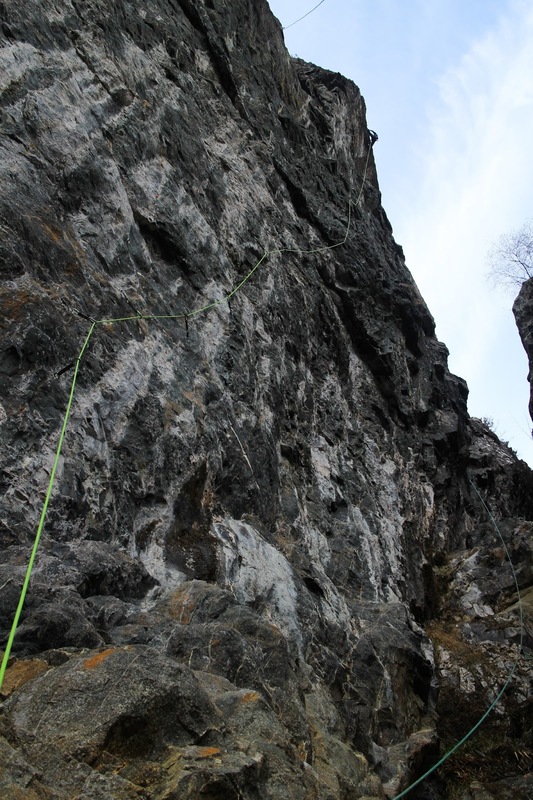 The problem with picking hard routes is it narrows the choice considerably. The idea drifted in and out of my mind each winter, but it was always such a long shot to catch it in condition at short notice, yet be fit enough to actually do it, it hardly seemed worth bothering with. But at the same time, I’d been going on about it to friends for years and years. 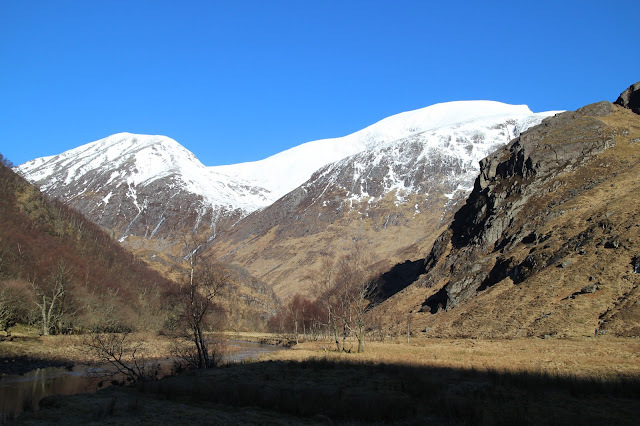 This year, with the ‘Beast from the East’ easterlies we had in early March, I was stuck in Glasgow in the snow and hearing that at home in Lochaber there was no snow in the glens but it was really sunny. The 24/8 suddenly popped into my head again. That period of weather didn’t yield a suitable day. 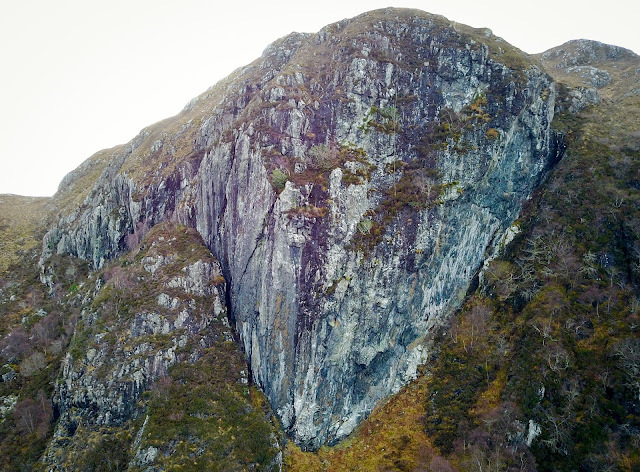 But when a second bout of easterlies came into the forecast models, I started to take a closer interest, and leapt out to Glen Nevis to look at the rock routes I might try. I spent a couple of utterly grim days trying to re-familiarise myself with Misadventure (E8 6c) and Leopold (8a) while getting pummelled by 60mph easterlies with snow stinging my eyes, on a low level crag! It seemed ridiculous. 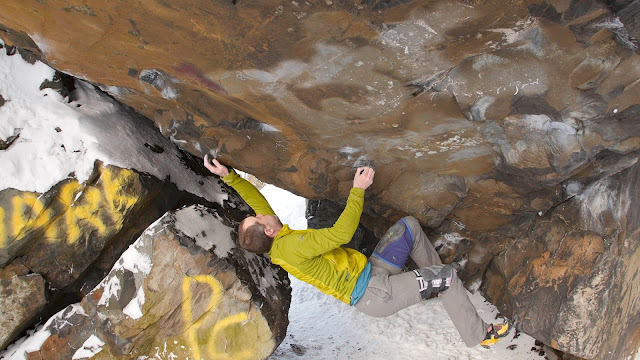 Previously, I’d thought the boulder of choice would be my own ‘Bear Trap Prow’ 8A+, but that is also often wet in winter. When I walked up to recce it, it was completely soaked. So my mind jumped to the Cameron Stone Arete, climbed only recently by Dan Varian at 8A+ and I’d repeated it a couple of years ago. It is very sharp and can cut your fingers, but does dry quickly. Thankfully I could repeat it in a session and felt like there was a good chance I could do it early in the morning if conditions were good. Monday 19th emerged as a weather window from nearly 6 days out. As the high pressure approached Scotland, the cold eastern would drop and leave a still cold, but fine day with light winds. 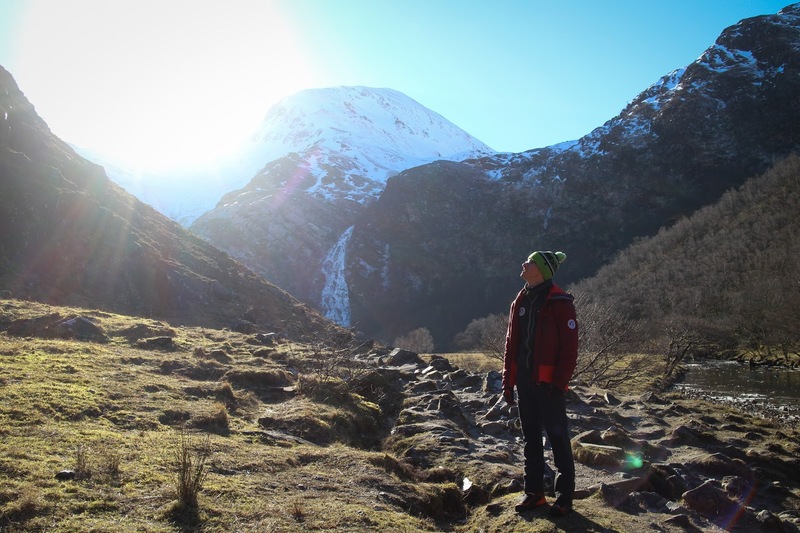 It seemed possible that it wouldn’t be too cold to lead Misadventure, but the mixed on the Ben would stay white. 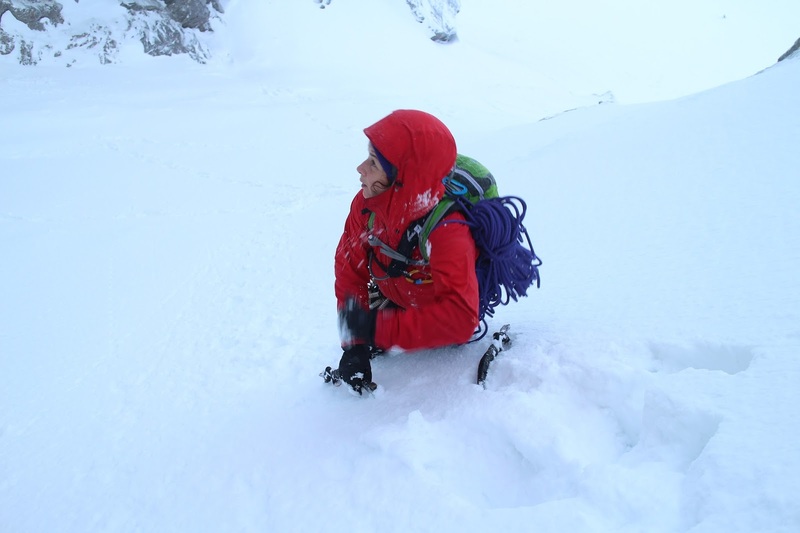 Choosing a winter route for the challenge was rather more tricky. Winter routes on the Ben at grade VIII do have a habit of taking a good chunk out of a 24 hour period, not leaving much time for 39km of walking and all the other rock routes. It needed to be something I could do quite quickly, and ideally as reliably in condition as possible. I had two days out last week with Helen Rennard, trying to figure it out. Both were complete failures. On the first day we headed for the routes above Echo Wall but had to turn back with avalanche danger. 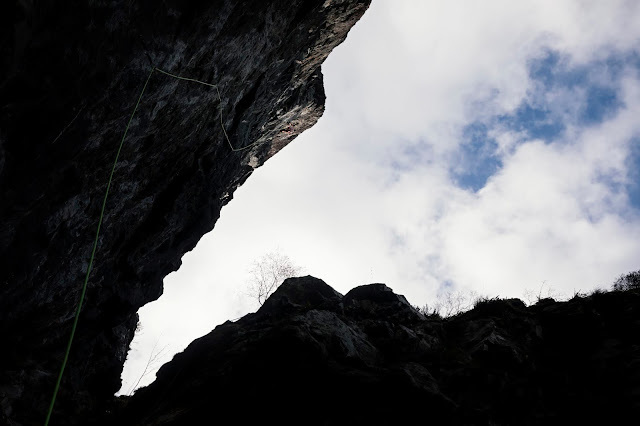 On the second, I climbed most of The Secret, but the crack was so completely choked with hard ice and reversed from a good bit up the crux pitch without any runners worth speaking about. Frosty’s Vigil was another idea, being high up and often in condition. But it was still an unknown whether the top pitch needed specific conditions of useable ice, or ice free cracks? On Sunday I was in Glasgow, watching Freida do Judo. 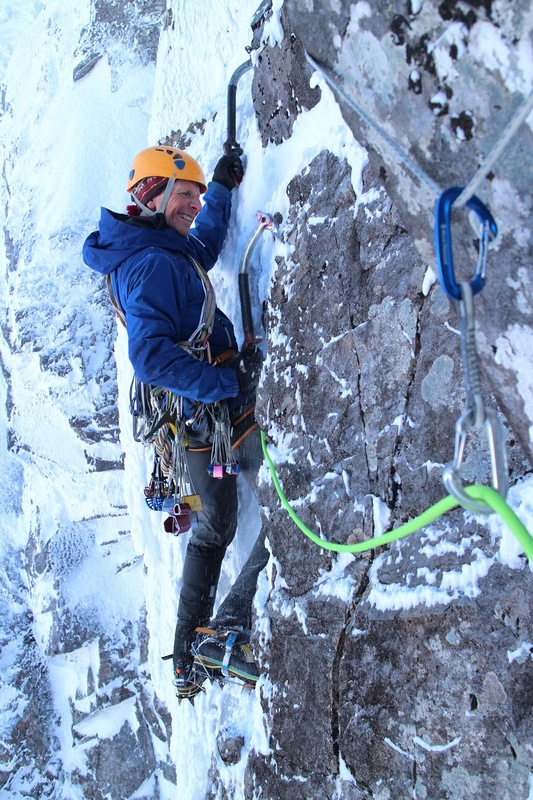 The forecast looked pretty good, if cold, and I’d arranged to climb with Kevin Shields for the rock routes, Iain Small for the winter route, and Kevin Woods to film the whole thing and join me for the Grey Corries traverse. A strong team!I was grateful to Claire for getting us home early and I thankfully got to bed at 8pm which set me up to feel rested and ready to climb hard at 6.30am. 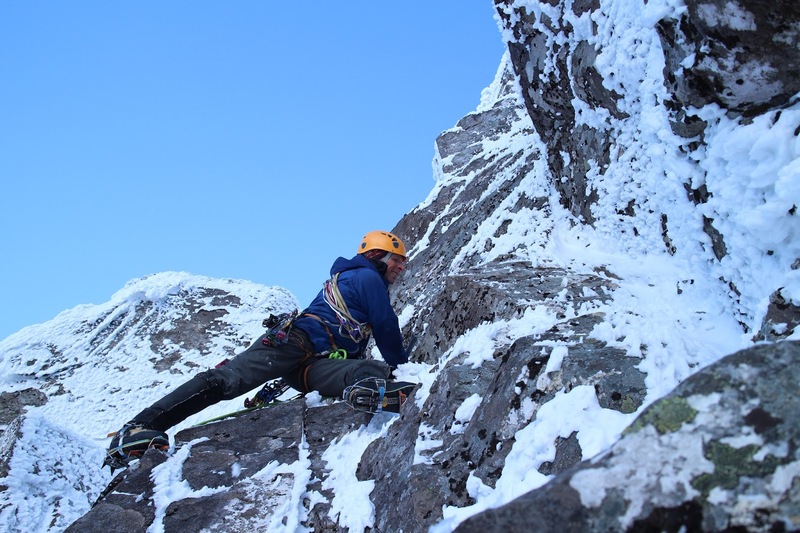 In case I did get a day to try it, I’d deliberately had nearly two weeks on climbing every day to really wear myself down, winter climbing, training and rock days back to back, followed by one rest day. I got up at 4.30am and made my usual pile of eggs, but struggled to eat them. I think I was actually a little nervous. There were quite a lot of logistical things to remember, but thankfully I’d spent the Saturday afternoon packing gear into separate packs so I could just lift them out of the car without thinking. Arriving at the Cameron Stone just as it got light at 6.30am, I realised the conditions were going to be even better than forecasted - probably the best day of the whole winter. It was zero degrees and no wind. Spot on. I had been worried that the forecasted minus two and northerly wind would just make it too cold for E8 trad. I took maybe ten minutes warming up, doing the moves of the Cameron Stone Arete (8A+) all first try. Then I pulled on just to do the start moves but continued all the way to the last move. I pretty much knew I could do it next go. A glance at my phone - 6.50am, chalk up and go. I climbed easily to the last move again but fumbled the foothold slightly, so the jump to the good hold was a bit wild. I grabbed it and felt like I was falling but just didn’t let go for a long second. Next thing I was standing on top of the boulder. Game on. 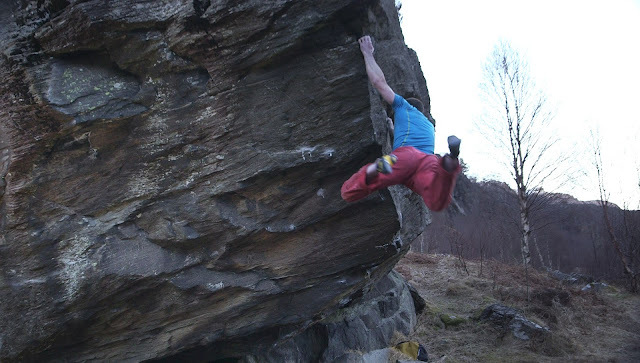 Half an hour later I was starting up Misadventure (E8). 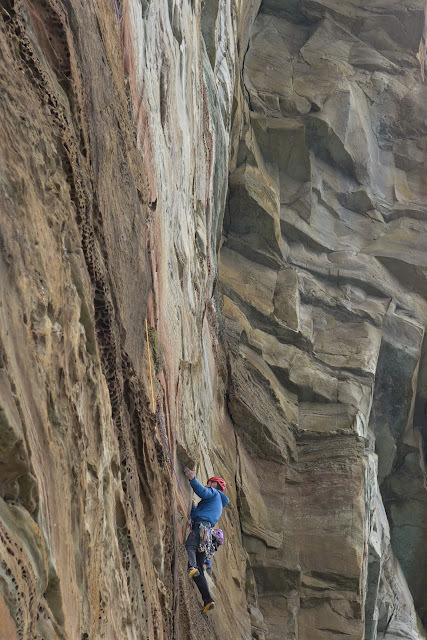 The climb takes a blunt arete with a bouldery sequence of slaps. 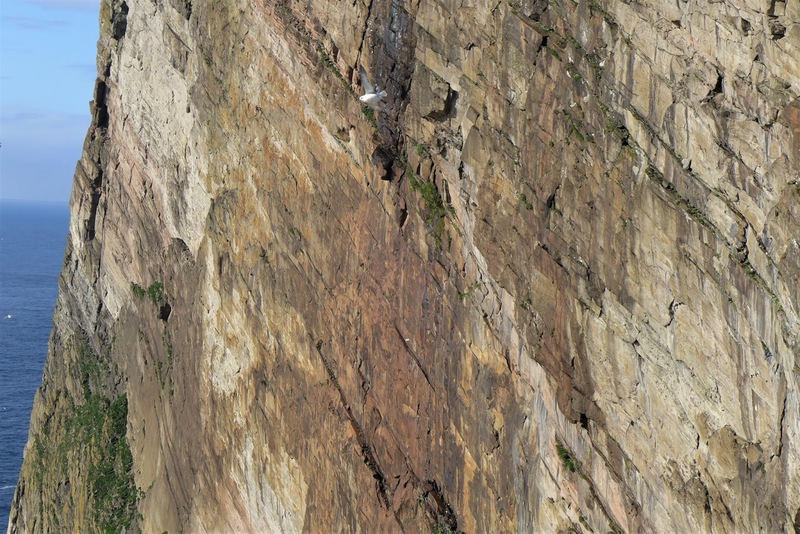 There is gear, but it’s off to the side in a corner, so a fall from the crux would smash you off the left wall of the corner. Its obviously hard to predict what would happen. But I doubt you’d get away uninjured. I suspect you couldn’t turn to take the impact feet first either. A sideways smash could be really horrible. So it’s not really a route to start up without knowing it will go. But after the boulder I knew I felt really good. However, as I set up for the crux slap out right, my foot slid a little on the foothold. I was completely committed, so the only solution was to up the power output and commit even more. I realised sometime afterwards, replaying back the sequence in my mind, that in that moment of psyching up for the move, I’d completely forgotten to move my right hand to an intermediate crimp first. Oh well, it worked out anyway, and I raced up the easier top section, carefully avoiding some holds that were covered in ice. At Steall car park it was still only 8.30am, half an hour ahead of schedule. 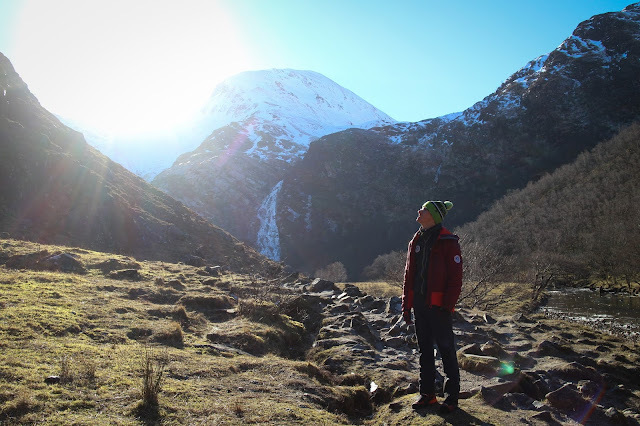 Kev Shields, Kev Woods and I bounced up the gorge path into lovely morning sunshine in Steall Meadows and I felt plenty warm enough for jumping straight onto Leopold (8a). The crux all felt easy (it ought to, I’ve done it countless times while trying my 9a there in the past). But as I approached the upper part, I realised that there was a lump of ice on a key foothold for the final rest, and a sidepull on the upper crux was completely encased in an icicle! Thankfully, I’d already sussed out an alternative sequence on my recce day, so could just move through without a problem. 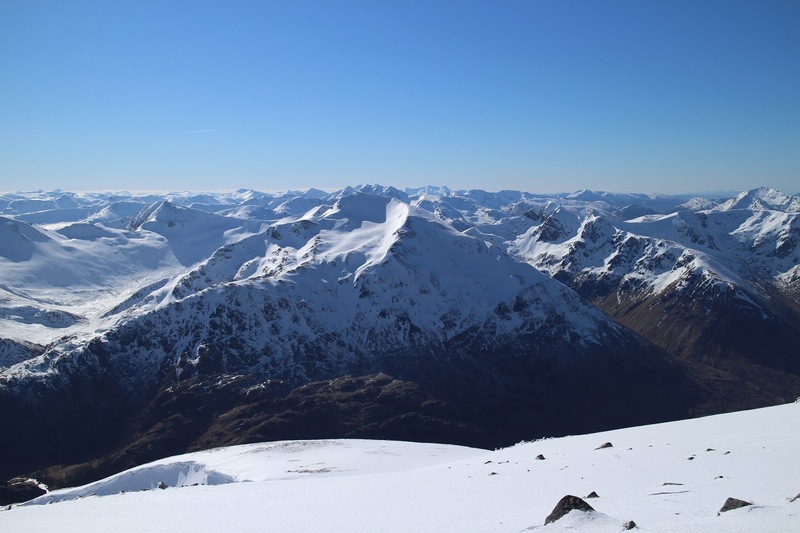 By 9.15am, I was back at the entrance to Steall meadow, thanking Kev Shields for coming out and off we went, contouring across Meall Cumhann and up the shoulder of Ben Nevis to the Car Mor Dearg Arete by 11am. 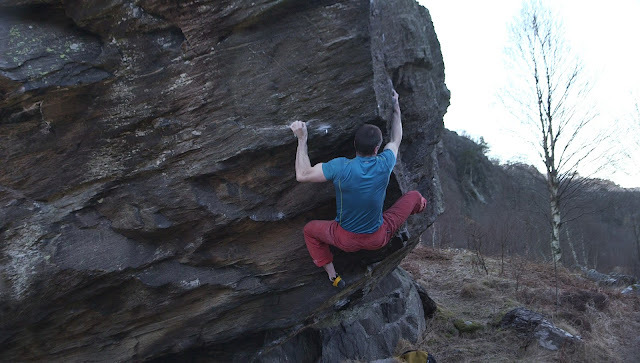 Iain Small literally making a VII,8 pitch look like a walk. He has a habit of this. I had arranged to meet Iain Small between 12 and 12.30 in Observatory Gully. 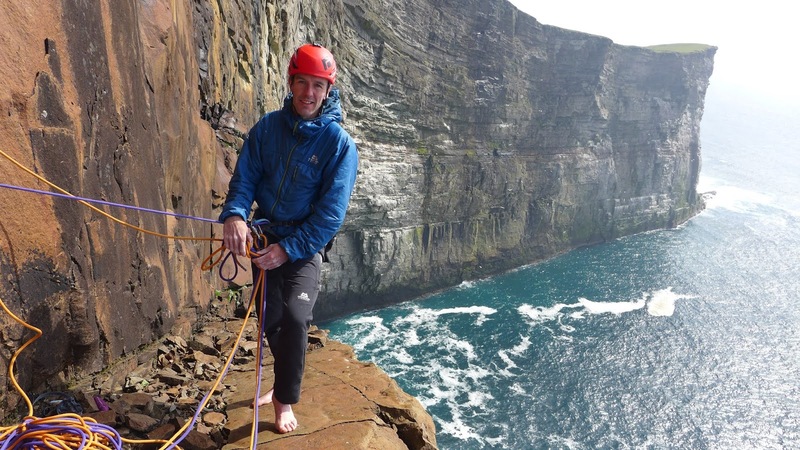 Thankfully, Iain carried up a full rack and a single rope as well. I opted for going over the summit and down Tower Gully, being careful at the cornice, since twenty years ago this is where it collapsed on me and I ended up going the full length of Observatory Gully in the resultant avalanche, including some impressive airtime on the way down Tower Scoop. No such problems today in the bullet hard neve. I met Iain just cutting a ledge at the foot of Frosty’s Vigil VIII,8. 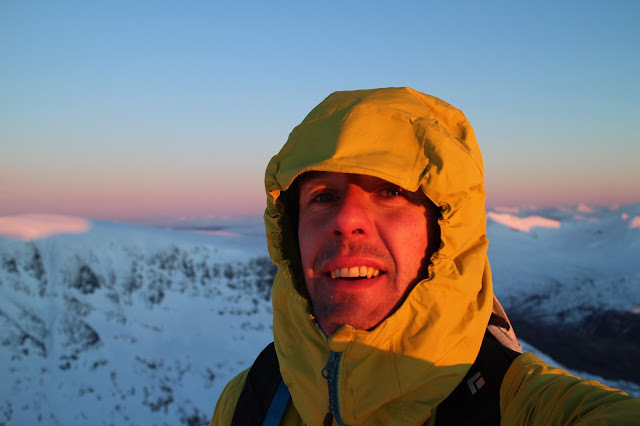 The route was first done by Greg McInnes, Guy Robertson and Adam Russell in 2017. I led pitch 1 and had a great belay stance under a roof, to protect myself from all the rime Iain had to clear from the corner on pitch 2. 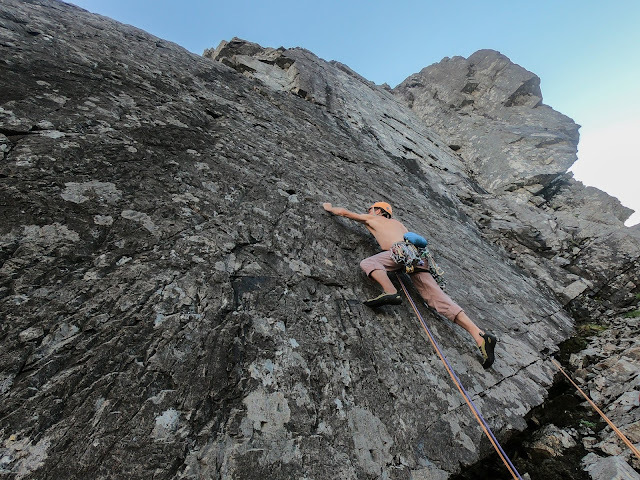 While I suffered the hot aches after seconding the pitch, Iain helpfully leaned out from the belay to arrange a nut runner to protect the steep looking traverse out right across the wall. Iain sniffing out some useful ice in the steepness. This pitch was really the linchpin for getting the link done. 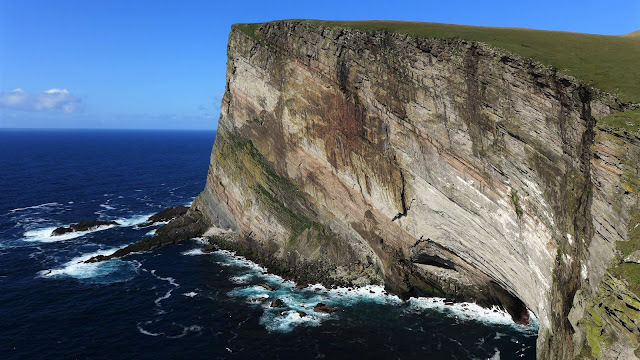 Would it be in climbable condition? I knew that it sometimes gets iced, but looked fairly mixed in the pictures of Greg leading it. Somewhere in between (iced up cracks, so no rock protection, but not enough ice to climb) could be a stopper. After a couple of steep moves across the wall, I had the reassuring ‘thunk’ of my ice tool finding a nice runnel of climbable ice. Moving up under a roof, everything fell into place with two really good Spectre runners to protect a steep step out from a roof to gain an icicle dribbling down the left wall impressively. Climbing this was very exposed and amazingly satisfying. With every ice tool placement I could feel the success of the day getting closer. 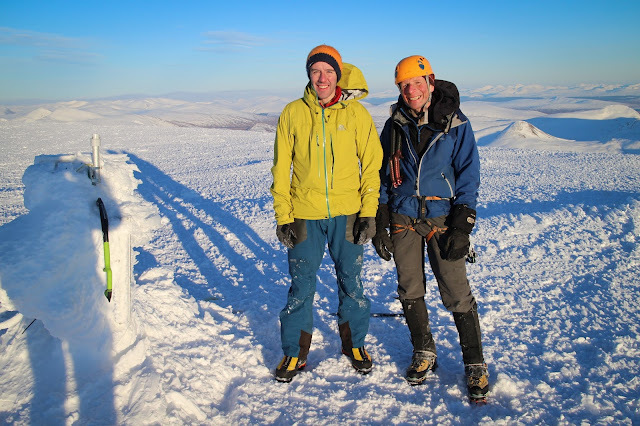 I think it was just before 6pm by the time we were all stood on the summit of Ben Nevis, hurriedly rearranging kit and having a brief chat before saying cheerio to Iain and jogging off down to the CMD arete, now a team of just Kevin Woods and myself. 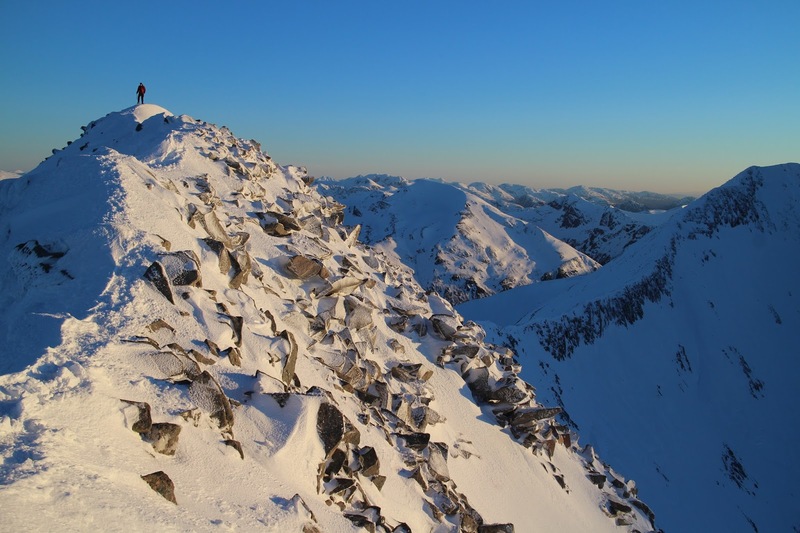 Running round to CMD was stunning in the sunset, one of the best I’ve ever seen on Ben Nevis. Kevin was just laughing all the way round. No words were needed. I felt exactly the same, it was so good it was funny! 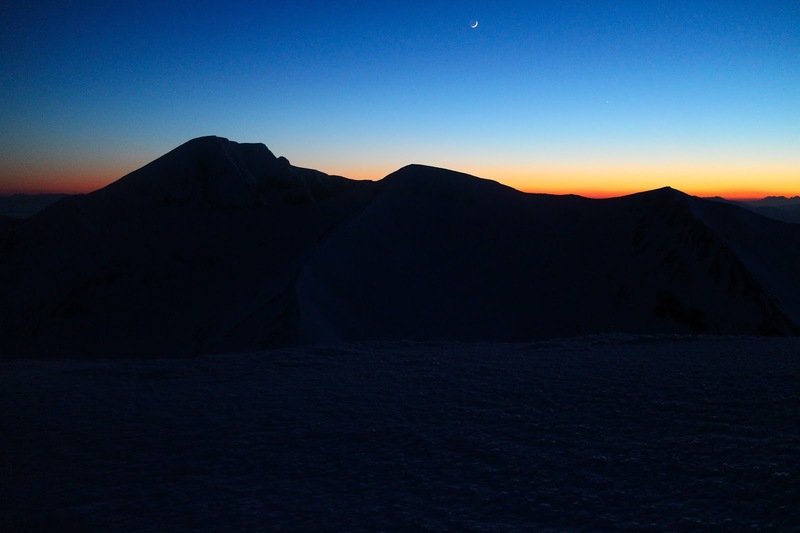 The sun was just about to drop below the horizon as we legged it down to the low col between CMD and Aonach Mor. The 400m climb back up was always going to be a calf burner. So there is nothing for it but to embrace the pain and keep moving. As an aside, I guess everyone has their own mental technique for beasting themselves through a big hill climb. I’m sure it will sound ridiculous to some but I always tend to find the rhythm of my feet kicking steps in snow aligning to proper trad pipe marches in my head. An acquired taste even for Scots but its what I grew up listening to so it is in the blood, as they say. They are so ruthlessly simple, bright and cheery, they just keep you going, putting one foot in front of another and somehow actually enjoying it. It’s no accident that they were often designed for the express purpose of making men march to their death. 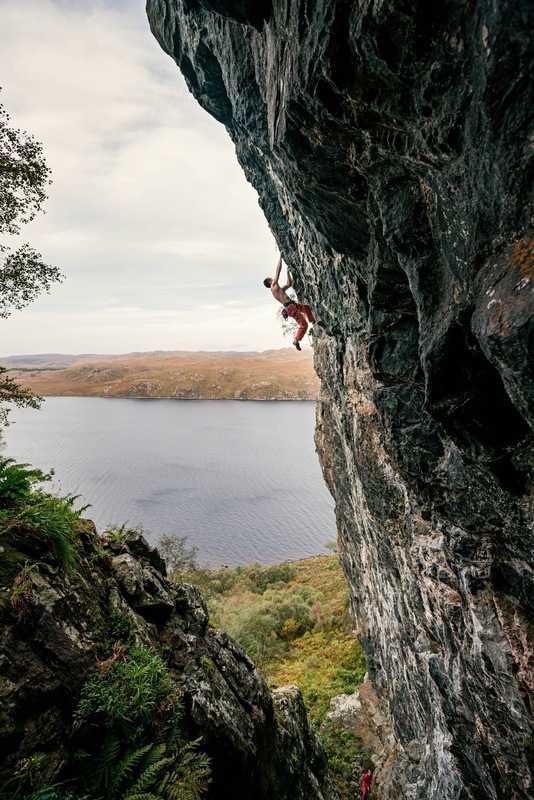 So now that we lucky modern folk have to dream up mad challenges to push ourselves to the point we actually realise we are alive, unsurprisingly they still work. My favourite is probably Mrs John MacColl, expertly played in this clip by Stuart Liddell. Lovely sky from Aonach Mor some time after 7pm. Ben Nevis on the left, Carn Mor Dearg centre. 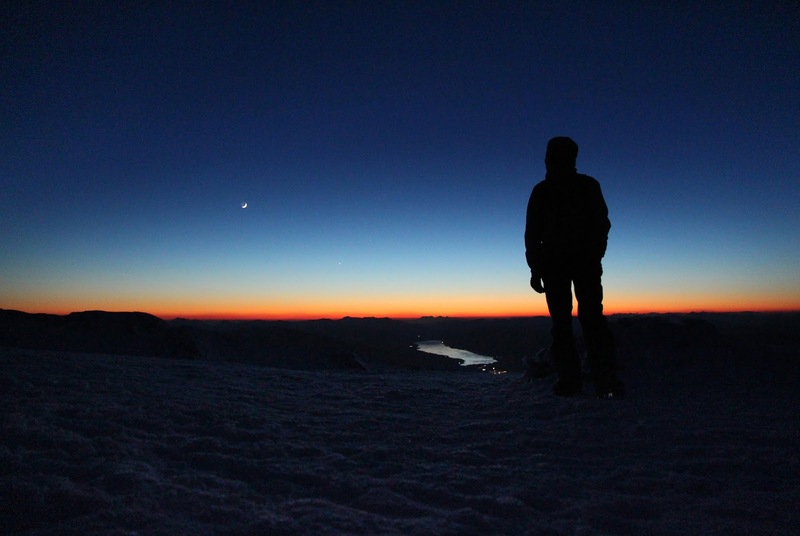 We were rewarded as we reached the Aonach Mor plateau with a stunning deep red horizon and amazing colour in the sky. But I noted that it already seemed extremely cold and I was starting to shiver after a couple of minutes food stop. Aonach Beag was straightforward as you would expect and we ploughed on down the ridge, Kevin’s good knowledge of the range helping us to locate the right spot to drop through the cornice and down to the col at the start of the Grey Corries. On the way down, we discussed our mutual state of dehydration. Gear carrying had been an issue for both of us (climbing gear for me, camera gear for Kevin) and the downside of the sunny day was more fluid requirements. 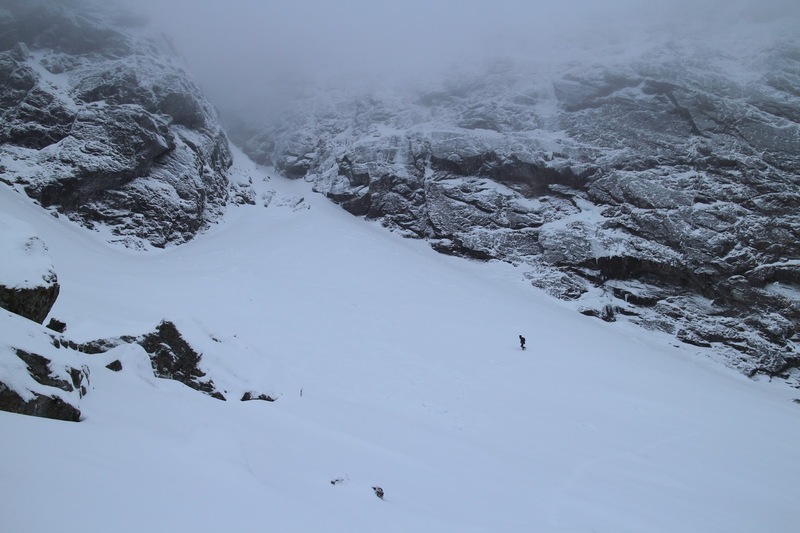 We skirted around the col before Sgurr Choinnich Beag in futile search for some moving water. There was none of course, so munching on icicles and rime biscuits it was. The Grey Corries ridge line is always a pleasure to move along. Of course we were getting tired, but just plodding on is not so bad. It is only really an injury or fuel crisis that would stop you on this terrain. 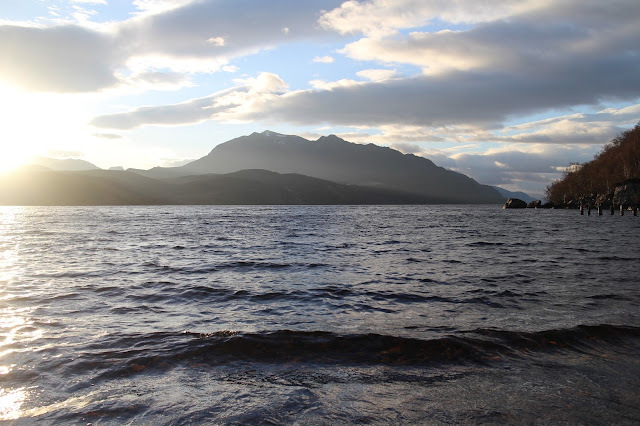 Several years ago I was doing a fasted Grey Corries run and had just such a fuel crisis; acute hypoglycaemia symptoms that forced me to stop, lie down and then have a long stumble out to Leanachan Forest and Spean Bridge. No such problems now with a much improved metabolism from two years of eating a lot of fat and doing a lot of fasting. I knew I would eventually slow down a bit with fatigue, but not stop, regardless of taking on calories. In fact, as we reached Stob Coire an Laoigh I noted a slight euphoria spreading gently across my brain, and feeling slightly stronger again in the legs. The wind picked up a fair bit and still felt colder than I expected, which I thought must just be the effect of eating ice biscuits and having damp gloves I’d sweated into for 8 hours. It was definitely chilly though. I had stuffed rime crystals into my Platypus and then put it into my base layer to melt. But even after two Munros I got barely 5ml of liquid water. 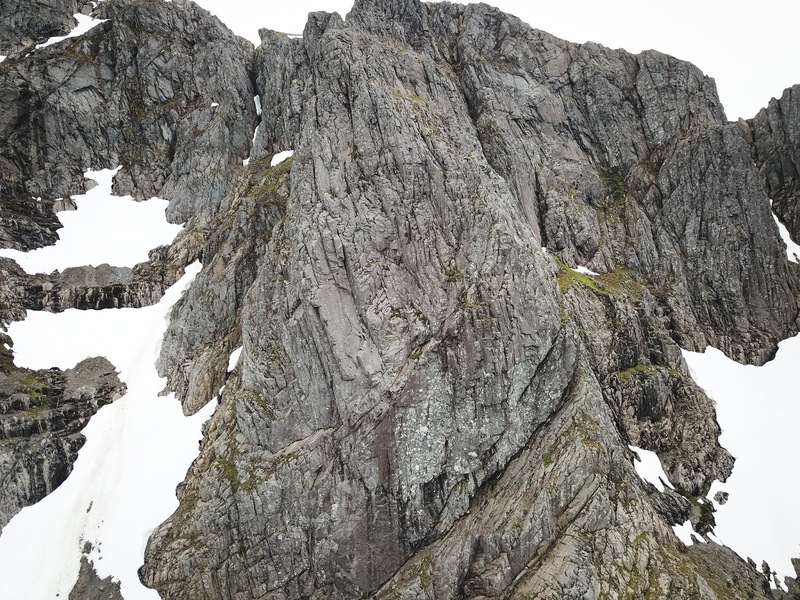 I remembered slogging up Stob Coire Claurigh at the east end of the Grey Corries with Andy Turner while filming ‘The Pinnacle’ eight years ago and feeling kind of knackered (we’d done Orion Face in the morning). This time it felt okay and so we wasted no time in ploughing on to the base of Stob Ban, the final Munro. I did feel tired enough on this to need to stop for five minutes and eat a tasty combo of dark chocolate and ice biscuits to help it go down. The funny thing was, once I got up and started again, the summit was only another 40 odd metres above! As expected for this type of day out, I was a bit too fatigued and cold to jump around and celebrate the success. I just noted the time (1:20am, 18.5 hours after starting) and we celebrated by taking a bearing for Larig Leacach and discussing the imminent prospect of getting down to a stream. The first water we found was right by the bothy in the larig. Kev pointed out that it was still an 8km walk out to my house in Roy Bridge and asked if we could have a quick snooze in the bothy. Kev snoozed. I was impressed he could. I couldn’t even sit still without shivering like mad and instead had myself a mini aerobics session in the bothy to arrest the shivering (didn’t work). I’d warmed up after a few Kms and all that was left was a nice wade through the river Spean. It was partially icing over. I later found out it had been minus 8.6 at Tulloch during the night, which explains why it felt so cold in the wind. The dawn just started to break as we walked up my street and back to my house. Claire kindly got up and made us piles of eggs and tea and I started to realise that a little climbing dream of eight years had actually been quite a big climbing dream I had never thought I’d get in condition, or myself in condition to manage it. It was so glad of the opportunity to do it and to have a good climbing team of Kevin Shields, Iain Small and Kevin Woods, all excellent climbers and exactly who you’d want on a day like this. Having filmed Ramsay's Round last summer I was particularly impressed that Kevin was able to follow me for the whole thing and film at the same time. Not an easy thing to manage, either physically or logistically. I’m looking forward to seeing his footage! Its been a fantastic winter where I’ve done most of my projects for the season, all of which were hard for me. Time to move onto my spring rock projects I think. But this one will definitely live long in the memory.